CSUN's 60th anniversary Matador Fun Run 5K is open to runners, walkers and wheelchair participants and will take place Oct. 13 on campus. Photo by Nestor Garcia. Summer is the season of physical activity. While many people are outside hiking, running or swimming, others lack the motivation to get moving. 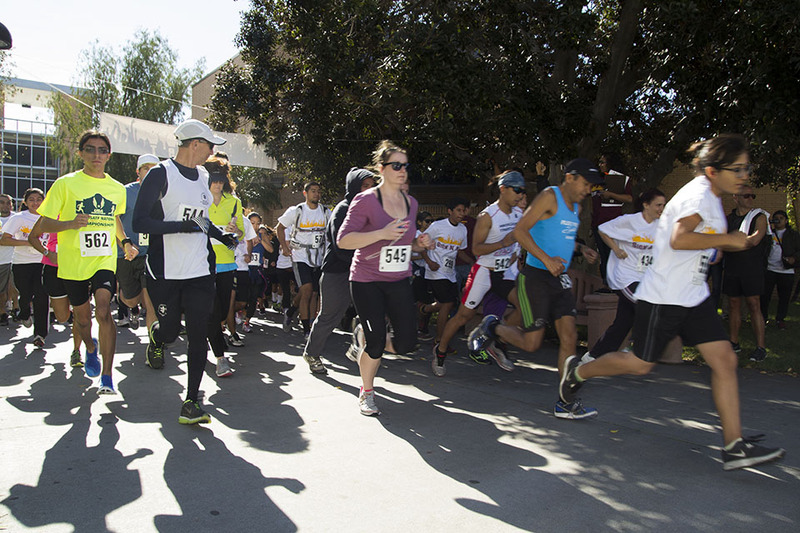 The California State University, Northridge 60th anniversary Matador Fun Run 5K (open to runners, walkers and wheelchair participants) on campus, Oct. 13, might provide that incentive. And regardless of your current state, if you use the time leading up to the event to train, nearly everyone can participate. Loy’s community exercise program, 3 Wins Fitness, is providing a free training program for the Matador Fun Run 5K beginning on July 30. With a combination of 3 Wins Fitness training sessions run by CSUN kinesiology students and structured, self-paced walk/jog plans, the program is designed to prepare participants to complete the 5K in 11 weeks of training. Loy called the 3 Wins Fitness program is “Los Angeles’ largest free diabetes exercise program.” It focuses on small goals, like the fact that losing 5 to 7 percent of body weight – generally around 10-15 pounds – can reduce the risk of diabetes by 58 percent. With approximately 80 percent of the population not engaging in an adequate amount of exercise, starting with small goals can be a great first step to improving health at any age, Loy said. But before beginning a training program, Loy urged that people begin with a good foundation. Starting slow, especially if someone is not regularly physically active, can help to decrease injuries and increase chances of follow through, Loy explained. “Start with a five-minute walk, three times a day,” he said. Then, each week, add up to 10 percent more time or intensity to the activity to allow for adaptation over time. “Not only is it preparing one’s heart and lungs, but it’s also preparing muscles, ligaments, tendons and connective tissue,” Loy added. Loy urged athletes not to rely on their past memory or experiences to determine at what level to start training. It is better to start from the beginning again, he said, rather than risk injury by pushing too hard, too fast. For those who are unable to attend the training sessions, Loy recommended using the 3 Wins Fitness walk/jog training plan. The program is the same one used in conjunction with on-site workouts for those who are able to attend the sessions. Regardless of whether one trains alone or with a group, setting a goal can help them cross the finish line.